What does Five Good Friends do? An overview of who Five Good Friends are and what we do. Five Good Friends provides in home care that cares for you and your loved ones. Your skilled and caring Community Manager meets with you to understand your needs and goals. They will design a Personal Help Plan and match you to the best Helpers. To find out more about the sign up process Call 1300 787 581 or hit the chat button at the bottom of the screen. Our vetted and verified network of local Helpers are not only skilled and caring they bring joy to their work every day. We work to make sure the same Helpers returns regularly. 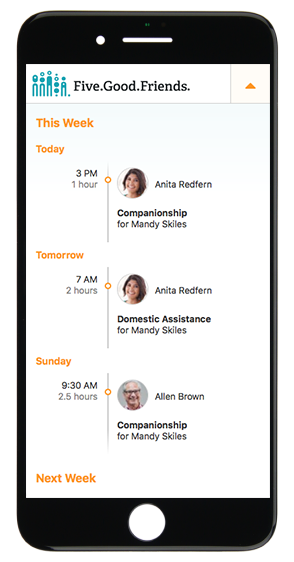 The Five Good Friends app lets you and your loved ones know who is coming and when. See your help schedule up to two weeks in advance and contact your Helpers or Community Manager directly if you need to make a change. Find out more about signing into your account. No matter how little or how much help you need, you can choose what services you want and when. Our combination of a membership and flat rates for care means you can schedule your services at night, on holidays and weekends, allowing you to live your life on your terms. We also have long stay and holiday packages for an onsite Helper, 12-hour day or overnight. The combination of membership and easy to use technology enables us to provide you and your loved ones more hours of care. Our focus is on what type of help you want, not just tasks and hours. You pay a weekly membership fee and then receive help at a significantly cheaper rate than current providers, no minimum hours. For people who have Home Care Package or NDIS funding, Five Good Friends services can be used to get care at significantly cheaper rates. Call 1300 787 581 or hit the chat button at the bottom of the screen.